Water leaks can not only be hard to locate, they can also be very destructive to property. These leaks can hit you in the wallet as well, and cost hundreds of dollars every day. Our Water Leak Detection in San Tan Valley uses highly advanced technological and non-invasive methods which accurately pinpoint those hidden water and sewer leaks. If you're in this unfortunate situation and discover a water leak problem, taking action immediately will protect your wallet and also the value of your property. If water is finding a way to leak, we will find the source of the problem. Every second counts and you need to get to the bottom of the problem as soon as possible. Using our top of the line water leak detection equipment and experience, we will locate every type of hidden leak in your home, pool, slab or business. Some of the signs of potential leaks you should watch for include: higher than normal utility bills, sound of running water when faucets are off, cracks in floors or walls, moisture or mildew under carpets. We will leave no stone unturned in our Water Leak Detection in San Tan Valley. Some areas of leakage are easy to locate and others are very well hidden. We will locate the source in either common or uncommon places. Don't waste time if you detect a problem. The longer you wait, the more damage can occur. Don't pay too much, or suffer the property damage that can result from choosing the wrong company on the job. We will be your partner and correct the problem utilizing the least disturbance possible. 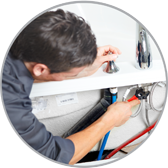 Contact us today about our expert water leak detection services.